later and now operates successfully with 8 staff members. 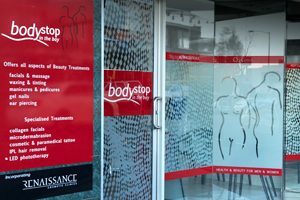 Body Stop is not only a health and beauty clinic but also offers an extensive service menu which includes Cosmetic and Paramadical tattooing, LED Light treatments, Injectables, Chemical Facial Peels and Microdermabrasion. . Body Stop also has the wonderful Eco Mineral Makeup range, and are stockist of Ultraceuticals and OCosmedics.